My source, Eat Little Bird has another recipe that didn't use custard powder. I used the custard powder versionbecause I just wanted to clear up my pantry. 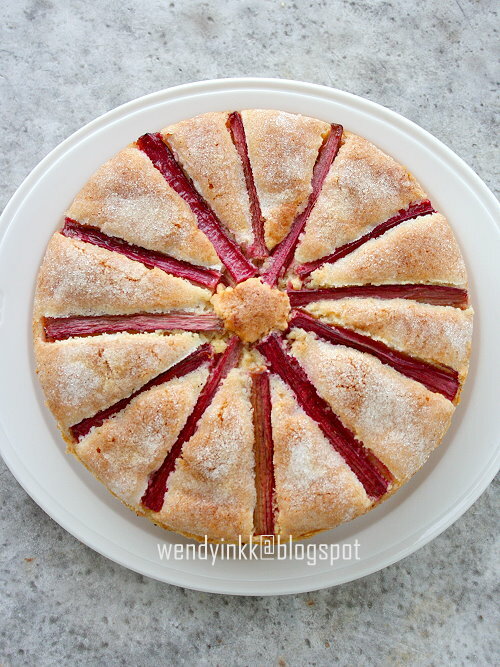 And she made the topping in another way so that she can sneak in more rhubarb. 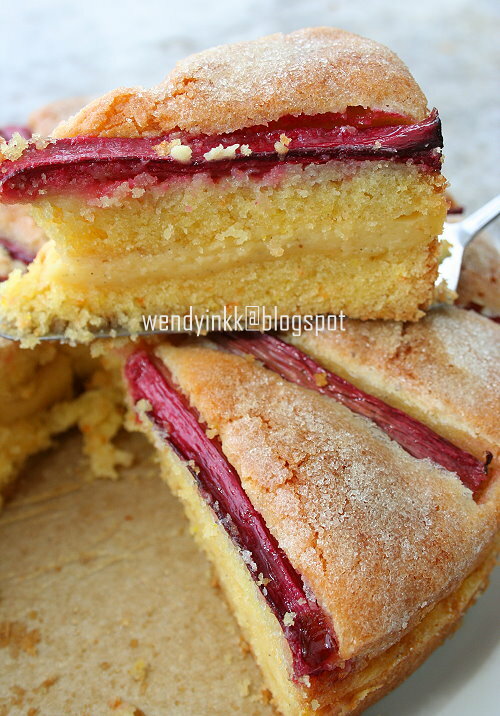 I totally agree with her on this, that this cake has too little rhubarb. But sometimes, we do choose looks over anything else, LOL. 2. Sift flour, baking powder and custard powder together. 3. Prepare batter. Cream butter and sugar together, then add in eggs one by one, beating well between additions. Put flour in and mix until a thick batter forms. 4. Preheat oven at 180C, fan OFF. Remove chilled custard from fridge. and lift the custard up with the cling wrap. Line the pan's side and base with baking paper. 5. Put half the batter into the pan and level it. Peel the cling wrap from the top of the custard and flip it onto the batter (smooth it, if needed). Top with the balance of batter. Smooth the surface. 6. Cut rhubarb into 3 inch long pieces, and try to fit as many as you can, from 10-12pcs if you can. Sprinkle with sugar and melted butter. 8. Let it cool down completely before slicing. What a beautiful looking cake! That's a great tip about chilling the custard. 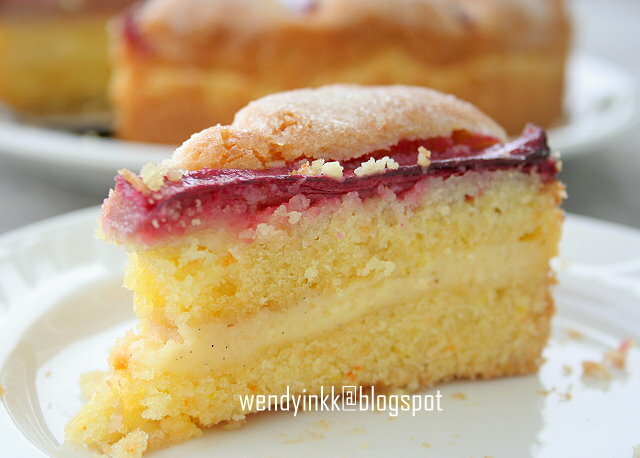 Whenever I've made this cake, I've always been nervous about the custard layer not setting properly, but I've always been pleasantly surprised each time :-) I'm so glad that you enjoyed this recipe. Hi Wendy, your cake is nice. 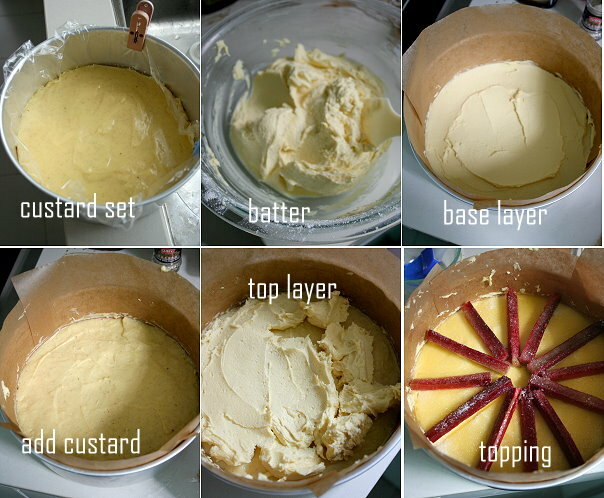 By the way, do you still have any other recipes for instant custard powder beside Hokkaido cup cake? I accidently bought 2 packs of instant custard powder and need to clear it before expiry. Thank you so much. No, this recipe doesn't use instant custard powder. Maybe you can google for recipes that uses "Instant pudding mix", as this is the term used in US. There are ample recipes on Kraft's site.